This Curly Indian hair weave is alive and full of body. With lots of versatility, you can go from wet and curly to flat ironed bone straight. Please keep in mind that the length of this hair is measured when straight. These curly locks will improve after every shampoo because it has the natural cuticle intact allowing the proteins to be replaced giving you up to 2-3 years of wear. Our Virgin Curly hair does not shed or Tangle making this hair very low maintained. Because this hair comes in the natural form and color we recommend a professional stylist for custom color desires. This Curly Indian hair weave is alive and full of body. With lots of versatility you can go from wet and curly to flat ironed bone straight. Please keep in mind that the length of this hair is measured when straight. These curly locks will improve after every shampoo because it has the natural cuticle intact allowing the proteins to be replaced giving you up to 2-3 years of wear. 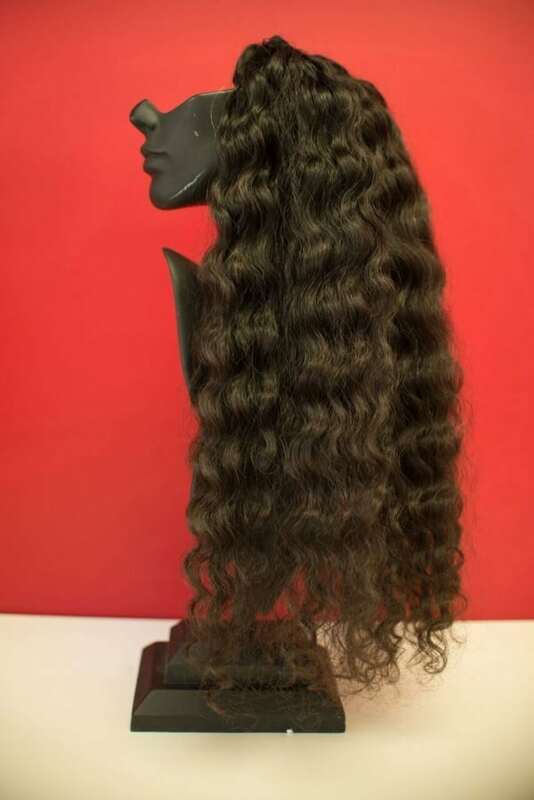 Our Virgin Curly hair does not shed or Tangle making this hair very low maintained. Because this hair comes in the natural form and color we recommend a professional stylist for custom color desires. ABOUT VIRGIN HAIR: This texture is completely natural and unprocessed. No chemicals are used whatsoever. Since this real Indian hair is just washed and left untreated, it may appear dry out of the package. You do need to maintain it by shampooing and conditioning, using Joico is also recommended to achieve the life span and improve integrity. Styling and maintenance is required to reap the many benefits of this virgin Indian hair. The hair comes to life after shampoo and condition, and gets better over time. ABOUT COLOR: Our virgin hair comes in a combination of completely natural off-black and dark brown colors. There will be color variations between bundles, some lighter and some darker. The hair can be colored; we suggest using a professional stylist for coloring. We also offer Custom Colors in a variety of 30 Colors that my take up to 6 weeks to ship.